It’s actually been a few weeks since I saw Inside Out and it occurred to me the other day that I never actually wrote a review. We’d seen the Minions movie the week before and that was such a flop that I was probably just hoping it wouldn’t be the same. However Inside Out is Disney so the chances of it being a flop our low -in fact I already knew I would love it before I went. As with all Disney movies, there are elements for kids and elements for adults. Most movies are kid based, but with another subtle level aimed at adults. In my opinion this is not the case for Inside Out and while there is plenty to enjoy for kids, I genuinely believe this movie is aimed at adults. 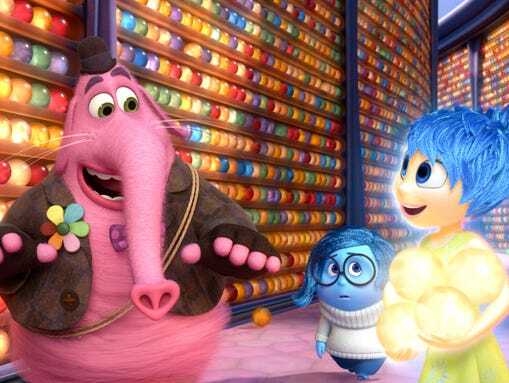 The concept of the movie is all about emotions, our brain being an area that features five characters (and characteristics); Joy, Sadness, Disgust, Fear and Anger. The main person in the story is a girl called Riley and so the main emotions characters (as listed as above) are hers. However as the idea is we all have these five emotions, it does feature those of Riley’s parents – and the end a funny montage of various peoples emotions too. So the movie follows Riley growing up and then at the age of 11, her family move because of her dad’s job. This is the main period of time during the movie, explaining how her emotions and her react to the situation. However disaster strikes when Joy and Sadness accidentally leave HQ (the main control area) and end up lost long term memories. Telling you too much more would drastically spoil the movie for you and therefore I won’t. However I will say – 1) You come to love Sadness, even though she seems incredibly pointless and annoying to begin with. 2) Bing Bong will make you both happy and sad. He may well make you cry. 3) If you’re a parent this will probably make you reflect on your child’s life and maybe even make you cry about that. On paper I thought that Disgust would be my favourite but actually she plays a sort of minor role (as do Fear and Anger). However I loved Joy and I think you will find it hard not to, along with Bing Bong as I stated above. Kids will love this movie as its colourful and fun, quotable and of course has a good base story. Adults will love this movie because we understand all the clever jokes, the way emotions effect us and generally just life. If you haven’t seen this movie you are missing out so go see it now! At least catch it on dvd when it comes out if nothing else!